‘BORN IN THE wild and ready for the City’ that’s how the latest Mercedes Benz X-Class X350d 4MATIC flagship model was described by Nadia Trimmel, Mercedes Benz Vans Southern Africa VP. With a gravel voice- she addressed hordes of motoring journos at the Turbo V6 launch in Cape Town last week, that was followed by a long haul of a test drive of the new derivatives through the majestic wine-route Franschhoek. Powerful X-Class V6 Turbo launch in Cape Town. All images SLM. Both derivatives Progressive and Power Auto X350d, were taken off the road and although it was pleasant, for some going through the hills and valleys proved a mission but adventurous. With a powerful six-cylinder engine, 7G-TRONIC PLUS automatic transmission, and 4MATIC permanent all-wheel drive, the new X350d 4MATIC flagship model develops 190 kW and a peak torque of 550 Nm. This is a vast improvement from the previous model that was launched early this year, albeit some of the journos believe the VW V6 possess more power. The tough performance double cab completes the sprint from 0 to 100 km/h in 7.9 seconds. Permanent all-wheel drive ensures high levels of driving stability and handling dynamics both on and off the road. With a choice of engine and transmission response levels at the driver’s fingertips, from comfortable to sporty, the X350d 4MATIC offers the perfect blend of sportiness and practicality for an agile life packed with variety. Add the prestige and status of it being a Mercedes-Benz – voted as the “world’s most valuable premium vehicle brand for 2018” – and the result is quite simply the most powerful double cab on the market. “The demand for midsize double cabs with typical passenger car characteristics and comfort features has been steadily on the rise for years. At the same time, the number of double cabs for private use is increasing. They are no longer viewed purely as “workhorses”,” as per media statement. The 3.0-litre six-cylinder diesel engine with common-rail direct injection impresses with its sheer assertiveness. Its maximum torque of 550 Nm is available over a wide engine speed range from 1400 to 3200 rpm. This means that high torque is already available from low engine speeds. Whether for a sporty driving style, comfortable long-distance touring, or off-road driving in difficult conditions – the V6 always ensures serene and efficient progress. The 7G-TRONIC PLUS automatic transmission included as standard, complete with steering wheel shift paddles, operates with no interruption during gear changes. The wide gear spacing allows an individual driving experience via the DYNAMIC SELECT system. 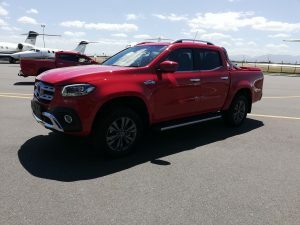 With 1632 millimetres at the front and 1625 millimetres at the rear, the X-Class V6 has a wide track, providing the ideal prerequisites for optimum driving stability and higher cornering speeds. At 3150 millimetres, the wheelbase is also longer than in many midsize double cabs. This reduces vibrations during the journey and makes for smooth and reliable straight-line stability. The X-ClassV6 features a comprehensive array of comfort and safety features seldom seen in this segment. The basis for the high level of occupant protection is provided by the particularly robust body shell with its high-strength passenger cell, plus a structure whose front and rear sections are able to absorb energy by specific deformation. For passive safety, the standard equipment includes seven airbags and the i-Size attachment system for two-child seats. Seasoned media guru Thamie Mthembu (left) addressing motoring journalists at the launch. With optional Active Brake Assist and Traffic Sign Assist, two driver assistance systems are at the ready to simultaneously increase active safety and comfort. Additionally the X350d 4MATIC – as the top model of the X-Class –also features Active Lane Keeping Assist as an option. 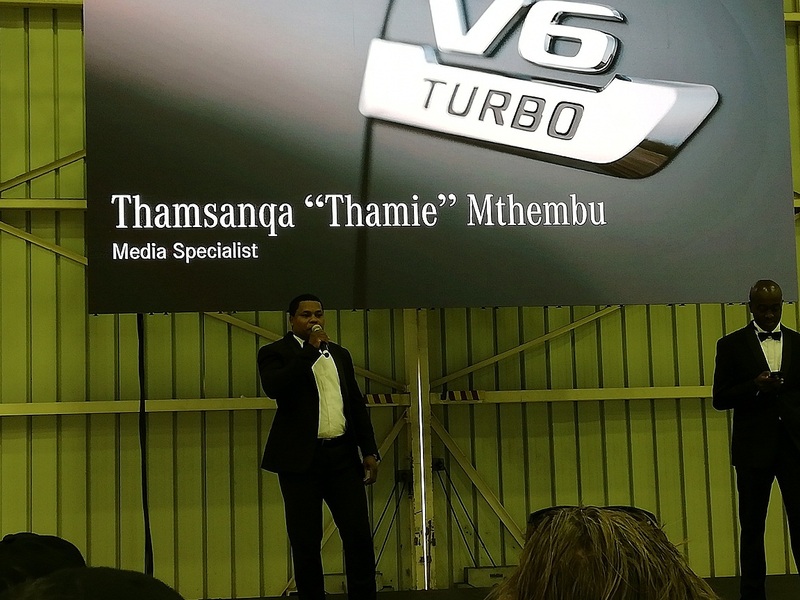 Well traveled and newly appointed media specialist Thamsanqa “Thamie” Mthembu, also made a promise that electric models will be made available in the SA market, “as a direction of the future”.